Loki, Odin's son and brother of Thor, is at the center of what is going on in Asgard and on Earth... but what is his role in these events? 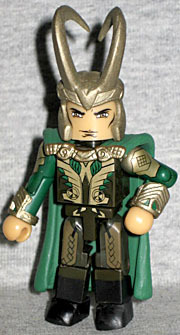 Loki is what I love about Minimates and Odin is what I don't. I squarely fall on the "paint, not sculpt" end of the Minimate spectrum and they captured Loki's chest armor perfectly with paint. Add to that a great helmet, a cape and some wrist guards and you get a great figure. I must confess I love horns and as a result I am just a huge sucker for Loki and his movie helmet is especially cool. They did a pretty good job capturing it here, but assumably for scale and safety reasons the horns are more rounded in circumference than the actual thing but it's still cool. The only real concern with it is that its brim rides pretty high (or Loki's face is painted too low) so there is just enough forehead visible for it be subtly weird. Still though, the torso paint and detailing on the cape and wrist-guards is just great. The father of both Thor and Loki, Odin has ruled over Asgard for generations. But now the unprecedented period of peace and prosperity they have recently experienced is now threatened. Will Odin be in a position to stop this new threat? Similarly, the sculpting on Odin is very strong, but again, the question must be asked "why?" I guess it's probably to bulk him up to show age/girth/import but it is a little conspicuous when standing next to his sons. I give it a hard time but really it looks and plays out fine, and at least the arms and legs are standard and fully functional. Speaking of helmets, how cool is Odin's!? It has nice subtle references to both his sons' iconic helmets. Unfortunately there are no interchangeable hair pieces so all you get is the helmeted look, but frankly that's okay 'cause if given the choice, who wouldn't pick the helmet? Odin also gets the sole accessory of the set, a spear-ish staff. 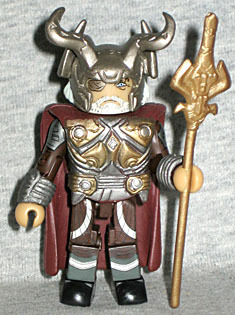 Odin also holds a special place in the Minimate pantheon - Anthony Hopkins is one of only four actors to be immortalized in Minimate form from multiple properties: he stands proudly next to Scarlet Johansson and Samuel L. Jackson, who ironically both have Minimates from The Spirit and Iron Man 2, as well as fellow Thor star Ray Stevenson, who, similar to Hopkins, was first available in two costumes comprising 50% of a four-pack; in his case Punisher War Zone and for Sir Tony, Silence of the Lambs.